It is a common enough question in sports that it has become a tired cliché every time it’s uttered by yet another hapless announcer. But the above question is something that many athletes and coaches find themselves asking this question within a game or match, or as the season progresses and results aren’t up to expectations. One of the most exciting rivalry currently playing out in Jiu Jitsu is between rookie black belts Keenan Cornelius of Atos and Jackson Souza from team Checkmat. On the surface this rivalry sees the clash of two opposing strategies with which one can play Jiu Jitsu. Keenan is famous for his flexible and virtually-impassable guard, while Souza is feared for his Judo and crushing top game. These archetypes are not uncommon in the sport, where athletes known primarily as highly-technical guard players such as Romulo Barral, Rafael Lovato Jr. and Braulio Estima are often paired against those with reputations as monster passers such as André Galvao, Rodolfo Vieira and Xande Ribeiro. Yet each of these athletes would not be at the highest attainable levels of Jiu Jitsu if their games were not incredibly well-rounded. But do the new generation of black belts also have the ability to play anywhere with expertise, or is the current trend of highly-specialized competition strategies diminishing the versatility of modern Jiu Jitsu athletes? In early 2014, Tennis’s world number 2-ranked Novak Djokovic had a highly-publicized change of strategy when he brought aboard a new coach to adapt his style of play to the evolving game. While early results were shaky Djokovic was able to beat rivals Roger Federer and world number 1-ranked Rafael Nadal within weeks of each other. What allowed Djokovic to come off the baseline and play a more full-court strategy was his dedication to being among the most versatile players in the game. Likewise, a change of strategy can pay dividends in Jiu Jitsu. One of the all-time great guard players, Rubens “Cobrinha” Charles finally beat rival Rafael Mendes by utilizing his wrestling in the finals of the 2013 ADCC in Beijing, China, and featherweight top-player Augusto “Tanqinho” Mendes was able to beat both Cobrinha and Rafael Mendes in the same day by strategically using the 50/50 guard and superior wrestling, respectively. Finding ways to maximize your scoring opportunities while avoiding your opponent’s strengths requires an athlete to be adept at all aspects of Jiu Jitsu. The first meeting between Keenan and Souza at the 2013 IBJJF world championships was one of the most highly-anticipated matches of the tournament. Keenan’s former team had been trying to arrange a match between the two, who were seen as the two best brown belts in the world (Paulo Miyao had something to say about that, though). The pair finally met in the semi-finals of the brown belt absolute division, and the match ended up being fairly uneventful, but showed the strategic grooves the two would settle into over the course of their rivalry. Keenan pulled Souza into his lapel guard quickly after a testing Kouchi Gari attempt by Souza. At the time Keenan hadn’t really demonstrated his version of lapel guard in high-level matches, although others like Cobrinha and Braulio Estima had used versions of the position. After the match, Keenan filmed an introduction to the lapel guard, which is required viewing for understanding the matches between him and Souza. Souza keeps his legs back to prevent Keenan from wrapping up his legs and limiting his mobility, which is a key method of dealing with good guard players. Yet Souza had trouble getting past the lapel control of Keenan. As the match went past the first minute, Souza was able get dominant grips on Keenan’s pants. Souza swarmed with the toreador pass and a one-hand leg drag, but Keenan’s flexibility allowed him to pummel his leg back into the center, defend the pass and return to the lapel guard. This was an important moment in the match; Keenan had pushed back one of Souza’s strongest passes. Just prior to the three minute mark, Keenan was able to use the lapel guard enough to momentarily tie up Souza’s legs, allowing Keenan to initiate a deep berimbolo. Souza was able to scramble out at the last second. Keenan returned to the lapel guard and was eventually able to secure another berimbolo from lapel guard around the six minute mark, feeding the lapel under Souza’s leg in lieu of the de la Riva ankle grip. Again Keenan came close but was not able to secure the back or the sweep, as Souza was able to put his back on the mat and shrimp away to create enough space to allow him to get to his feet as Keenan rose for the sweep. The lapel guard allowed Keenan to use his legs to pressure against the passing attempts of Souza, and to tie him up, either in the lapelaplata, which he was unable to secure, or the berimbolo, which he was able to switch to on the other side when the lapelaplata failed. These berimbolo attempts set the stage for the next meeting between the two rising stars. Only the next time they would both be wearing the coveted black belt. Keenan has used the lapel guard several times against black belts since this match, with varied success. For example, his guard was passed by Rodolfo Vieira during Copo Podio, although Keenan was still a brown-belt at the time. Keenan was able to show a variety of sweeps from his unique take on the lapel grip against black belts at lower-level events. Dan Lukeheart of Brea Jiu Jitsu put together a mind-bogglingly in-depth breakdown of Keenan’s guard that includes his use of the lapel guard in these matches. The second match between Keenan Cornelius and Jackson Souza took place as the final of the 2013 IBJJF Pro League heavyweight division. Again Keenan pulled guard following a shot attempt by Souza. Already Souza was changing his game-plan, while Keenan was refining his own. Instead of keeping his legs back to prevent the guard of Keenan, Souza stood tall to strip the lapel grip. It didn’t work out, and Keenan was able to go back in his lapel-berimbolo position. But that’s not to say Keenan wasn’t making any changes, he initiated the 50/50 from the berimbolo and managed to sweep Souza, and in later attempts was able to get to a Miyao-style crab ride. This presented an interesting moment in the match where Souza threaded his own legs inside Keenan’s to prevent the back take. Keenan simply shook Souza’s legs out and worked for the back take, which Souza defended by turning in and pressuring back into Keenan. Several additional close berimbolo’s followed until Souza jumped on an ankle late in the match allowing Keenan to come up for two points. While the last match had been decided on advantages, the second instalment saw Keenan able to get a bit deeper into his game and capitalize further on Souza’s leg attacks. The third match between the pair was sem kimono at FIVE grappling’s event in California, and while interesting in its own right, was not a major break in the pattern set thus far. The fourth and most-recent encounter however, saw the dynamic shift squarely in favour of Keenan, who was able to make small adjustments to his winning strategy after every match. It began with a major departure from Souza. Souza’s complete avoidance of using the guard was made light of by Keenan after a ridiculously boilerplate attempt at Jiu Jitsu journalism by GracieMag. Keenan must have been somewhat surprised when Souza pulled reverse de la Riva seconds into their match at the 2014 Abu Dhabi World Pro Jiu Jitsu Cup, from which he transitioned beautifully to the X guard. By gripping behind Keenan’s knee and elevating him with the inside hook, Souza was able to pull Keenan’s over his body into the one-leg X guard position. He immediately switched to full X guard, yet kept the overhook, which lacks the power to stretch out one’s opponent to the same degree as swimming under to elevate the leg on your shoulder, yet provides access to a variety of other attacks including leglocks. As Keenan attempted to back-step out of the position it looked like Souza thought about a heel-hook for a second before trapping Keenan’s legs and sweeping. It was a beautiful series that showed how changing up one’s strategy can afford an athlete the element of surprise. Souza followed up with some aggressive double-under pass attempts, which, due to the shorter time limits in Abu Dhabi, could have been enough to clinch the match and stall out the remaining time. Yet Keenan was able to fight back to de la Riva guard. Keenan usually starts very slowly, but knowing the lack of time remaining, he inverted immediately into a berimbolo. Unlike previous attempts where Souza conservatively kept his back to the mat, the Checkmat star sat up to fight Keenan’s legs, which exposed his back. Keenan took the opportunity to push in to top position for the sweep, although he was facing away from Souza. It looked like there was no way to hold on to tie up the match. Souza, as is his habit looked to immediately turn into a sloppy single-leg takedown with a grip on Keenan’s pants instead of allowing the sweep. Keenan turned his hips and was suddenly fighting for Souza’s back. He was able to take the back, sink his leg-triangle and eventually force Souza to issue a single tap in defeat. Keenan’s spatial awareness ability to breakdown Souza’s defences resulted in him getting a bit further every time the two had competed, culminating in the double lapel choke from the back. Is there a lesson to be learned from this rivalry? It’s far from over so the tide could turn in Souza’s favour eventually. Neither are yet at the pinnacle of the black belt division, but Keenan has logged more time into his battle-tested game-plan, whereas it took Souza four matches to finally score a point on Keenan. Souza looks like his change in strategy to a more well-rounded approach paid off, but it was too little too late against the refinements Keenan had been making to his berimbolo, and his ability to account for Souza’s telegraphed tendencies. Keenan’s success in the first match, however marginal, was his cue to stick with his strategy of preventing movement with the lapel guard, tangling up Souza’s legs and working the berimbolo. Keenan switched from taking the back directly to using the crab ride to the leg drag in the second match, but went back to looking for the back in the fourth based on the defences Souza presented (back flat on the mat or sitting up). Souza’s initial toreador attempts in the first match may have been the most likely strategy to beat Keenan, as shown by the much larger Alexander Trans’s successful toreador pass against Keenan’s lapel guard in the quarter-finals of the absolute division of the 2014 Pan Jiu Jitsu Championship. Souza’s complete break from his normal game plan in the fourth match surprised Keenan and allowed Souza to dominate the early portion of the match. Used more strategically this well-rounded competition strategy will play dividends for Souza. 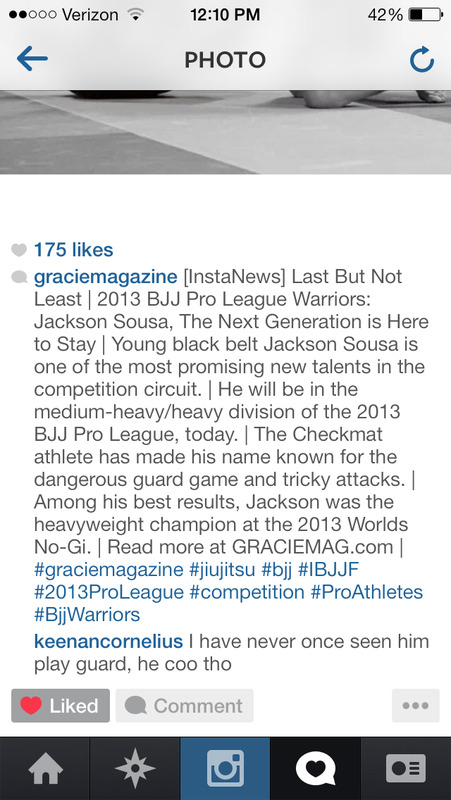 This article originally featured on The Jiu-Jitsu Lab and was reposted with permission from the owner.